If you're committed to having a positive driving experience in Prince Albert, the 2019 Dodge Charger could be the perfect mid-sized sedan for you. Riverside Dodge Chrysler Jeep can show you the many technological features that will keep you connected and safe on the road. The 7-inch digital cluster display will show you everything you need to know about the vehicle. When you're driving on the highway, you'll love the Adaptive Cruise Control with Stop technology. The system will keep you moving at a constant speed and slow you down if the car in front of you has decelerated. 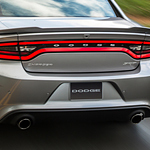 The Dodge Charger can help you maintain a safe distance from the car in front of you using the throttle and brake. To make it easy to get into your car, the Keyless Enter n' Go system will let you unlock a door by just having the key on you.